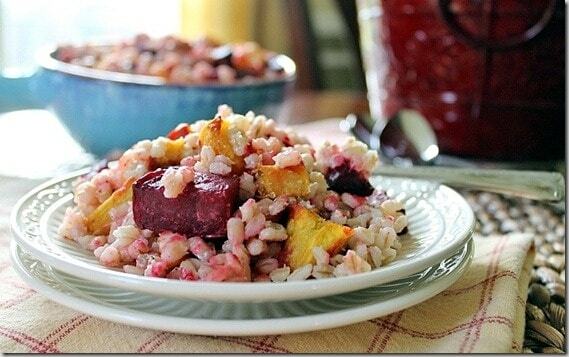 This roasted beets and barley with squash and goat cheese is a light, healthy lunch or side. It’s a hearty and filling vegetarian dish. Have you seen enough cookies this week? Because I’m about to turn into one. I’ve got about 50 bookmarked (and that was tough keeping it limited to that many) and have grabbed nothing but sweets between the *witching* hours of 2-4pm for the entire past week. ‘Tis the season. It’s time for some vegetables. Good news though! These veggies come roasted with tons of flavor and have goat cheese melting all over them. That’s not so bad, right? Cheese is almost as good as sugar and butter. 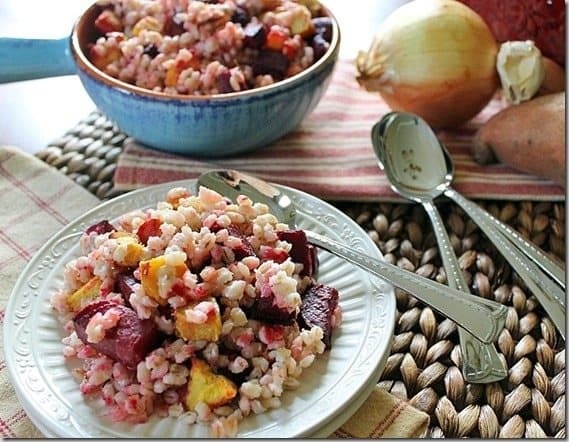 This roasted beets and barley with squash and goat cheese is a light, healthy lunch or side. It's a hearty and filling vegetarian dish. Bring barley and water to a boil in a small sauce pan, then reduce to a simmer for about 40 minutes, or until all the water is fully absorbed. While barley is cooking, spread chopped vegetables on a lined & greased baking sheet. Toss with olive oil and season generously with salt & pepper. Roast at 400 degrees for 30 minutes, turning once. 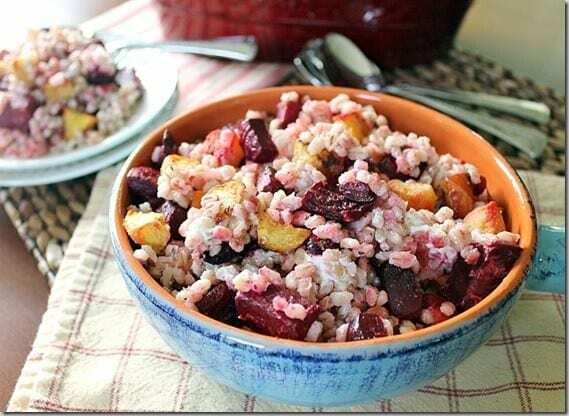 Combine barley and goat cheese in a large bowl. Fold in roasted vegetables, season again to taste and serve warm. Mmmm…love all these ingredients. And that creamy goat cheese– yes. I love beets. And I love that they make all food they touch…pink! I always say I’m going to buy barley next time I’m at the store but I always forget! Seeing this recipe tho? With all my faves in it? I MUST TRY THIS asap!! Looks so yummy!! Yum! I used to hate beets but I’ll pretty much eat anything with goat cheese. 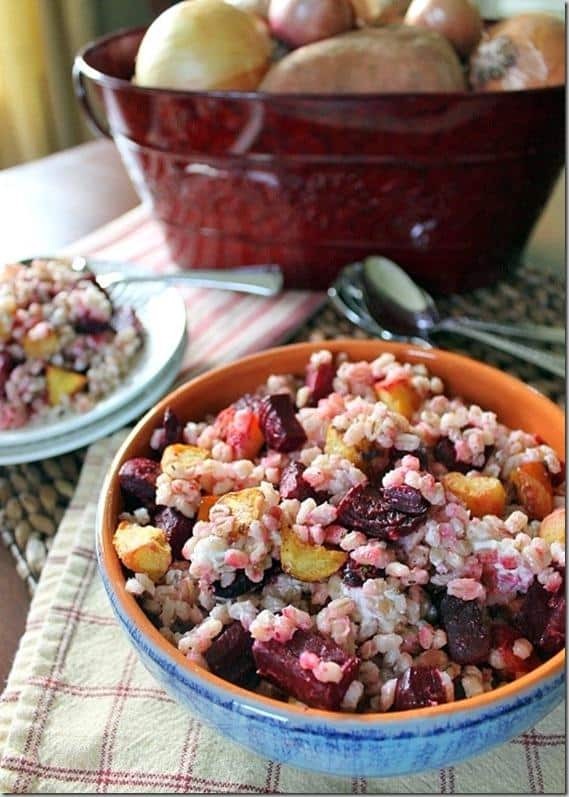 Mmm, this looks like the perfect healthy (and a little comfort food-y too!) go-to meal for a cool day. And goat cheese? I’ll just about devour anything with goat cheese! Thanks for sharing, sending this recipe to my printer!